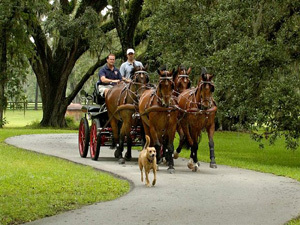 The serene backdrop of Live Oak Stud serves as Chester’s home and Team Weber’s base of operations when not on the road. Miles of wooded paths, open pastures and a training field provide ample space and variety of conditioning and preparing the teams. Dedicated employees and talented horses, combined with meticulously planned and well-maintained facilities, are key ingredients in Team Weber’s success. Beyond the intensity of actual competition are many days and months of preparation necessary for success. Behind the scenes and far from the spotlight, attention to detail is critical as Weber carefully manages the horses and crew that comprise Team Weber.